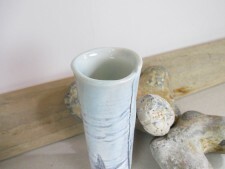 This slim bud vase is impressed with seashells and sea-themed pieces, by Rose Dickinson in Faversham, who works in porcelain and uses flowers, seed heads and seashells to emboss and design her beautiful ceramics. Her work is defined by the folding and overlapping joints she makes with the slab technique used, and each is impressed with her 'rb' makers' sign. 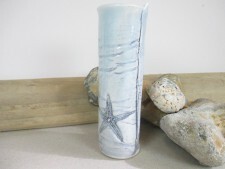 These new vases are glazed with a blue hue, defining the shells and producing a beautiful strong image.